The most industrialized zone of the district comprise areas under Asansol Subdivision and Durgapur Subdivision, The various five year plans created the new industrial areas of Durgapur and chittranjan, adding to the urban centres of the region, such as Asonsol, Kulti, Burnpur and Raniganj. The traditional industrial base of the region chiefly supported by coal, iron and steel has undergone a rapid diversification and new industrial ventures which include mainly heady engineering, fertilizers and coal-based chemicals, are now making a dominant of the water resources of the Damodar and a sustained programme of hydro-electric and coal-based thermal power generation modernization by providing the infrastructure for the regions growth. Between 1955 and 1965 a series of large and medium industries came into existence in Durgapur. A number of small industries also grew up to service these bigger industries and small industries. The principal industries beside Durgpaur Steel Plant and Durgapur Project are production cement making machinery, boilers, pressure vessels, etc, Alloy Steel Plant production a variety of alloy steels, Durgapur Chemicals Limited,production basic organic and inorganic heavy chemicals, Durgapur Thermal Power Station, Mining & Allied Machinery Corporation production coal mining, bulk handling equipments and other heavy machinery, Among the major industries of Asansol & Durgapur areas, at least some deserve individual treatment and these have been described below in same details. The site for Kulti Works in Asansol Sub-division was selected in 1871. 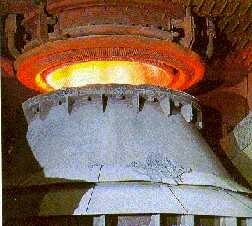 It is the oldest unit for manufacturing pig-iron and iron and iron casting in India. The factory was named the Bengal Iron Works and its origin is associated with the name of James Erskne. In 1880-81, the works was taken over by the public Works Department of the Government of India and was renamed as the Barakar Iron Works. In 1899, again, the factory was leased out by the Government to a new concern operating under the name and style of Bengal Iron & Steel Company Limited. During 1901 to 1936 transfer of ownership and rename of factory took place and finally in 1936, this Company went into voluntary liquidation and was merged with the newly created Indian Iron and Steel Company Limited (IISCO). 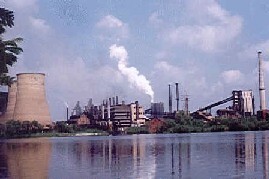 The Durgapur Steel Plant is located on the bank of the Domodar River. The construction work of the plant stated in 1957 and first blast furnace was commissioned on 29th of December 1960. The manufacturing process was based upon British technology. It was initially commissioned with 1 million tonne capacity. The Steel Plant runs its own washery. Water is supplied by the barrage on the Damodar river and power by the Damodar Valley Corporation. The well equipped Research and Control Laboratory of the Steel Plant plays an important role in maintaining and improving the quality of products. The laboratory directs research in the proper choice of raw materials and their economic utilization. It incorporates in its operations modern steel making techniques and quality control and offers wide variety of iron and steel products ranging form crossing sleepers and heavy structural, medium and light structural, track materials, rods in coils, wheels and axles to merchant sections, flat products like plates, sheets, strips, tin-plats and electric resistance welded pipes. The Alloy Steel Plant at Durgapur, established in 1965, with an initial investment of Rs. 70 cores is Indias first plant of its kind. It is equipped to manufacture all the initial grade of carbon, alloy and special quality engineering steels. The main plant came from Japan while the technical know-how was provided by a Canadian firm. Vacuum degassing for sophisticated steels at the Alloy Steel Plant is an example of the latest technique of steel making adopted in India. The Durgapur Fertilizer Plant is the first fertilizer plant in West Bengal and the sixth in the series of such plants managed by the Fertilizer Corporation of India. The factory has been designed mainly by Indian engineers and foreign collaboration has been kept at minimum. Its main raw material naphtha is supplied by the Indian Oil Corporation through an undergrown oil pipe line connecting their oil terminal at Haldia port with their refinery at Barauni. The Durgapur Project Limited is a West Bengal Government undertaking. The various sections of the integrated Durgapur Projects Limited are (i) A Coke Oven Plant with its by-products and tar distillation plants; (ii) A thermal Power Station; (iii) A gas line between Durgapur and Calcutta supplying gas for domestic and industrial needs; and (iv) A new industrial complex offering industrial sites and modern facilities. Government of India established a locomotive factory at Chittaranjan which is situtated about 7 miles form Asansol near Mihijam Station. Various factories have contributed to the growth of this area as a centre of locomotive industry. Prior to independence, the telephone cable requirements of Indian Posts & Telegraphs Department were being met by imports. Hindustan Cables Ltd. is a Government of India undertaking and the only manufacturer of underground dry core telephone cables and coaxial cables in India. The products have been acclaimed as the best in this country. Iron Utensils are made throughout the district. The manufacure of cutlery was carried on at Kanchannagar, about five kilometres west of the western of Barddhaman town. Brass and bell-metal utensils are manufactured at various places in the district. Bonpas, Dainhat and Begunkhola were once noted for this industry. This industry which once employed quite a large number of artisans, has declined. Other old time industries which are still found in the district, include cutlery, cart-making, clay image making, dairy, gold and silver smithy, lime making, mat-making, pottery, sweetmeats, tile making, leather work, carpentry, blacksmithy, oil crushing, crushing, cane and bamboo products, gur making; wood and stone carving, etc. The handloom weaving, an important cottage industry of the district, is at present mainly located at Katwa, the Katwa Industrial Centre being the main handloom centre of the district. The old centres of cotton weaving are Purbusthali, Kalna and Manteswar. As the industry still supports a good number of people in the rural areas, the State Government is keen on extending all possible help to the artisans working at the exiting handloom centres. Source : Barddhaman District Gazetteers.